Spring brings to mind things that are new and fresh, like the spring 2014 fresh, new standard and optional features now available on the Aeromaster line of tractor pulled compost turners. Proper maintenance is the key to long lasting equipment and greasing the moving parts of your Aeromaster compost turner is essential to maximizing its useful life. 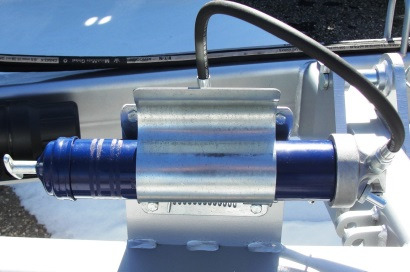 In order to make routine lubrication of the bearings, PTO U-joints, and the other moving parts of your Aeromaster compost turner, Midwest Bio-Systems now provides a grease gun holder on all Aeromaster compost turners. 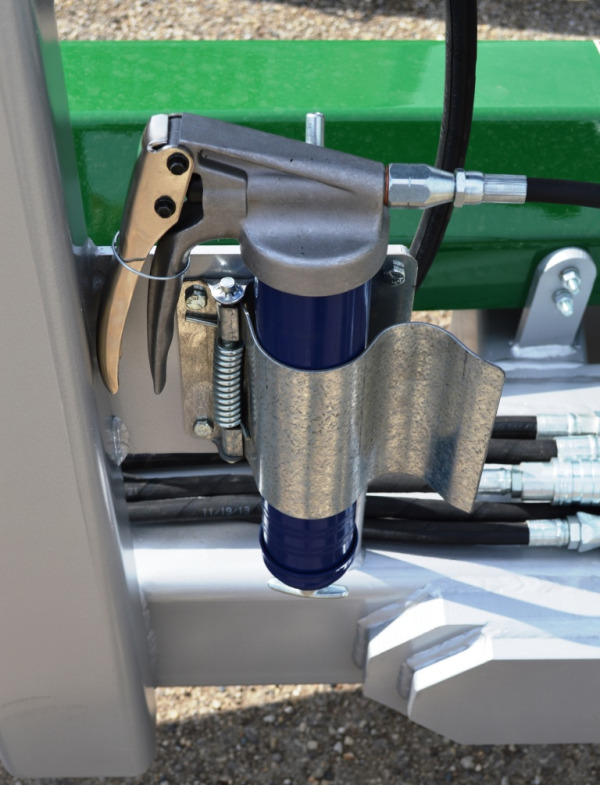 Easy access to a grease gun helps insure that the daily lubrication points listed in the Operator and Maintenance Manual for your Aeromaster turner receive grease. Aeromaster compost turners are built to last but the type of materials you are composting can impact the physical life of your compost turner. Some materials pose a greater threat of corrosion than others. Animal manure in the materials to be composted is more likely to corrode the sheet metal components of your compost turner that wood chips, for example. Midwest Bio-systems is pleased to announce the optional availability of stainless steel sheet metal to replace the standard mild steel sheet metal for customers making compost from corrosive materials. The optional stainless steel sheet metal is just one more way to increase the useful life of your Aeromaster compost turner. 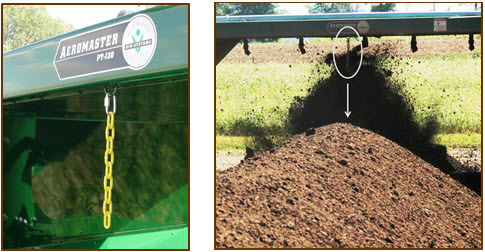 What’s the easiest way to guide your compost turner so it stays centered on the windrow your turning? Traditionally, the operator watches front left corner of the turner and tries to keep that corner aligned with the edge of the windrow. Midwest Bio-Systems has determined that using the new standard Center Line Indicator makes keeping the turner centered on the windrow much easier. This is simple concept, a length of yellow chain hangs down from the center of the turner hood. The operator simply aligns chain with the center of the windrow to keep the turner centered on the windrow. The operator does not constantly have to look down to keep the turner centered on the row. Contact Midwest Bio-Systems today to find out about all of the new, advanced features and options available on our Aeromaster compost turners.